Coaxial cables can be essential to running a variety of different signals. Radio signals, HDTV signals, internet signals, and so on. Copper cabling is so ubiquitous that you’ll find coax cables in both residential and commercial areas. So when problems start to emerge in your cable network, it’s pretty important to be able to localize, identify, and resolve them. And when it comes time for that, having a good coax cable tester can be essential. But how do you choose a good coaxial cable tester tracer? If you have a good idea of what you’re doing, then ending up with the right instrument isn’t very challenging. You really just have to think about the total length of the cables you might be testing, and the types of cables you want to test. From there, you only need to do some basic quality checks of the instrument. As you may know, there are actually a number of different types of coax cables. Because different cables are made for different types of application. Some people run coax cables for broadband video, others are running in CCTV networks, or radio antenna connections. But the most common types of coax cable are RG59, RG11, and RG6. What’s the difference? These cables have slight physical variance, which make them more suitable for different types of installations, but also make them perform differently when run under a coaxial cable tester/tracer. You may want to seek a tester that can accommodate these basic cable types. If you’re looking for one of the more esoteric cable types, you might end up having to choose a tester specific to those formats. Coaxial cables also have a wide range of different levels of impedance. It typically can range anywhere between 50 ohms and 92 ohms. If you’re not certain about the lines you’re testing, you’ll generally find lower impedance for radio transmitters, and higher impedance for HDTVs. More impedance generally means a stronger signal, but most applications these days don’t exceed 75 ohms. If you’re looking for a tool and you don’t know exactly how much resistance you’ll encounter while testing, then you probably want a tester/tracer that can handle at least 75 ohms. When the tester/tracer doesn’t explicitly let you know what it’s limit happens to be, it’s often possible to safely assume that limit is also around 75 ohms because it’s enough to handle virtually all residential applications. Good testing equipment shouldn’t be too complicated. Most of the time, using a coaxial cable tester/tracer should be as simple as plugging in a cable and hitting a button. But some instruments provide a more intuitive interface than others. Depending on your own level of sophistication, it may be useful to seek an entry-level tester/tracer instead of higher end equipment. In addition to a cable resistance limit, testers will have limitations when it comes to distance. Some of the more powerful testers are capable of reaching out towards 5000’ and beyond. But if you don’t actually need to test cables that run a mile in length, then you’ll end up saving a bunch of money by picking an instrument more appropriate to your own use case. This is an instance where you really have to understand the type of cabling you plan on testing if you want to end up using the right instrument. Great testing equipment is typically able to help you test and map more than a single location along the cable. For helping you quickly narrow down the location of a problem, being able to test multiple locations can be essential. Most handheld multi-test instruments are built to provide a total of four testing probes. But some instruments can run eight or more. Whether or not you need that kind of extra boost, again, depends entirely on your own circumstances. The Klein Tools Coax Kit was made rather specifically to help verify the continuity of an F-connector coaxial connection, and then help you to map out their location. Whether you’re doing routine maintenance of a network or you’re trying to diagnose a problem in the line, that’s a very useful design. 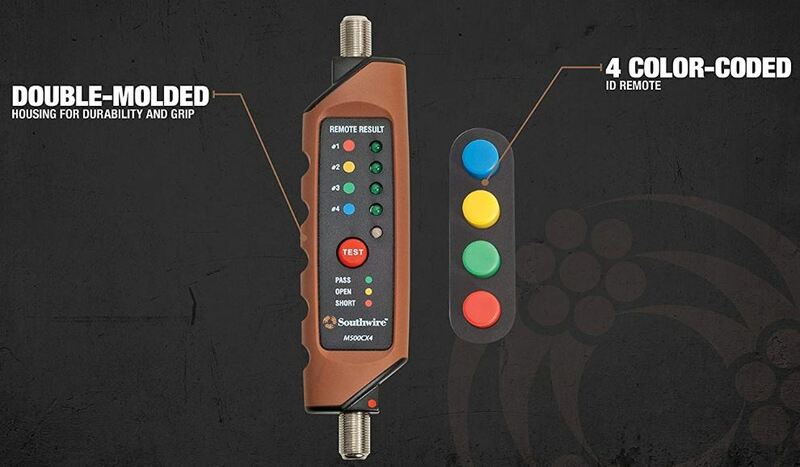 In order to help make the multi-testing process a little easier, the Klein Tools Tester makes use of a color coded design for each testing remote. Keeping things simple, this tester uses one button operation. You literally just connect the cable you want to test, press a button, and you’re done. Pretty hard to mess up. Similar to many Klein Tools instruments, this tester was built with a bright yellow chassis. Maybe it won’t be winning any beauty contests, but it’s certainly easy to spot among other instruments. The tester measures 5.75 x 2.38 x 1 inches, making it reasonably compact, and mostly handheld in nature. The chassis is primarily made from ABS plastic, which helps the instrument be at least partially impact resistant. The relatively lightweight nature of this instrument ensures if you did drop it, the damage would probably be superficial. Light scratching and nothing more. For actually using the Klein Tools Coax Tester Tracer, you’ll find the test remotes as well as the F-adapter can be snapped onto the remote. That’s with the use of a clip on the tester itself, which makes for both easy storage and easy access when it’s time to use those remotes. The front side has a very readable LED panel. It indicates whether the trace is set to pass, open, or short conditions for the cable that you’re measuring. The color coded push-on design allows for four cables to be tested and organized with minimal effort and minimal chances of confusion. One end is red, the other blue, green, and black. This instrument is powered with the help of two alkaline AAA batteries, which are included. However, the included batteries aren’t very strong, you’ll want to replace as quickly as you can. Once you’ve got a reliable pair of batteries inside, you can anticipate months’ worth of uninterrupted testing before you need to think about replacement. 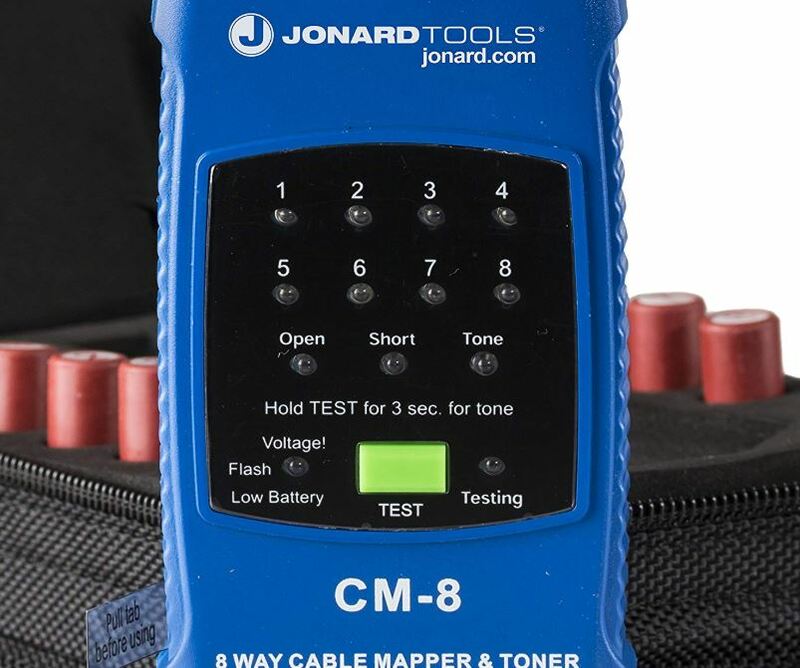 Extending its support much further than the Klein Tools instrument, the Jonard CM-8 is an eight-way cable mapping system. It’s capable of running maps for several coaxial cable systems from one central point, making it ideal for a variety of different coaxial cable installations. That might include installations for satellite TV, closed circuit TVs, alarm systems, and so forth. But more than simply handling more over greater distances, this tester can handle higher resistance cabling, too. That includes the ability to look for shorts on cables out for 4000 feet, on lines with a resistance of up to 100 ohms. Hard to imagine needing a more powerful instrument than this, unless you’re involved in some kind of industrial cable configuration. The CM-8 measures 2 x 1 x 2.8 inches, and weighs just shy of one pound. The blue chassis isn’t especially attractive, but it’s just as sturdy and protective as the instrument from Klein Tools. That’s because it’s made of essentially the same stuff, and built to essentially the same physical standards. Though there’s still no lanyard strap or carrying cable, once again, the device is lightweight and sturdy enough that occasionally dropping it shouldn’t be a grave concern. The interface is mostly made up of a number of LEDs, which allow the user to help determine if there’s an issue along the wire that you’re testing. As with the Klein Tools instrument, one-button operation makes this a pretty fool proof design. If you’re feeling a bit impatient, you’ll appreciate there’s a testing button to let you know the CM-8 is working. That way you don’t end up interrupting the instrument while it’s testing. The CM-8 is powered with the aid of two CR2 batteries, which are included. The included batteries seem pretty robust, so you won’t have to place them straightaway. And you ought to be able to get multiple months of regular use from the CM-8 before you have to start thinking about needing to replace the battery. There’s a low battery button to let you know when that time is coming. It may also be worth noting that CR2 batteries are pretty easy to replace, almost as easy to find as AA batteries, and relatively inexpensive. 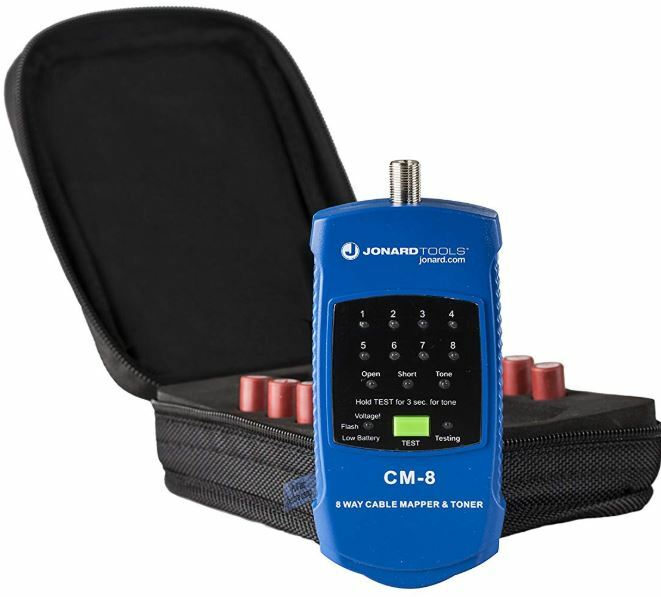 The tone generator can help support better cable tracing, though no probe is included. This kit includes eight cable identifiers, a pair of alligator clips, a Cordura carrying case, and a user manual. The carrying case is made of a rigid waterproof nylon, complete with a zipper to help keep everything secure and safe inside the case. Sometimes you don’t need a coax cable that can do everything. Sometimes you just need a simple tester that helps you do your job. The Southwire M500CX4 was designed to try and be that tester. The interface makes use of an easy to understand LED display, which makes this instrument very approachable. Even though it’s wonderfully approachable, it’s also able to provide a wide compatible for testing installed cables or testing patch cables. 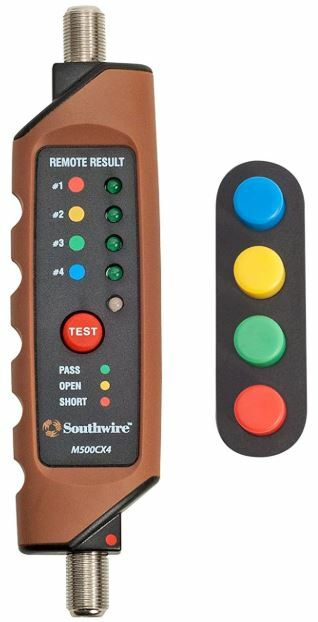 It can identify four coax cable remote locations, and includes four color-coded IR remotes, allowing it to perform every bit as well as the Klein Tools tester. The M500CX4 measures 5.5 x 1.25 x 0.5 inches, and weighs only a few ounces. It’s powered by four LR44 batteries, which are included. The unit was constructed with a double molded housing which serves to bolster both its durability and the user’s grip. Though again, ruggedness isn’t the highest priority for an instrument like this, it’s fair to say the M500CX4 is quite solid. Similar to the CM-8, you’re looking at a one button design that is pretty hard to mess up. But the interface is actually considerably more approachable and friendly than the CM-8. The device is pretty much made to where a total novice could start using it without having to so much as read the user manual. There’s not much in the way of extras of special features included with the MC500CX4. That’s probably a good thing because it’s reflected in the price. But there are some common sense features that are still included. For instance, you’ll find this instrument will automatically shut itself off when you’re not using the device. 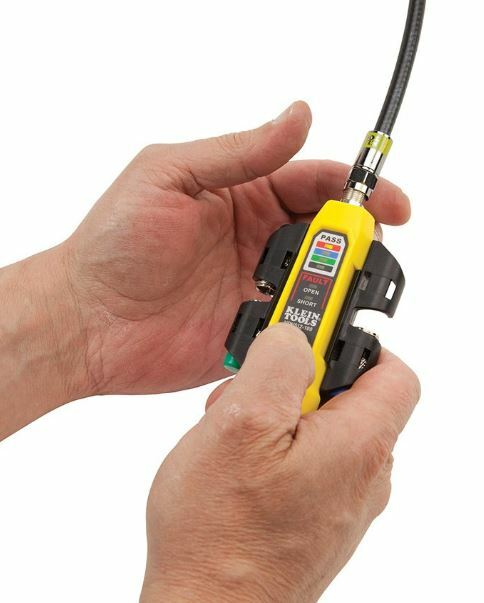 The Klein Tools Coax Tester Tracer Mapper with Remote Kit isn’t the right choice for someone who’s trying to test high-resistance lines, or someone who’s trying to test cables that run extremely long distances. But for most residential circumstances, this kit is going to perform marvelously. It’s simple, intuitive, and it gives you all the tools you need to get the job done. If you’re looking for a cheaper instrument for primarily residential use, you’ll probably want to try the Klein Tools tester. The Jonard CM-8 Coax Cable Mapper was made to handle lengthier cables, and it was made to handle cables putting out more resistance. The instrument itself is still reasonably intuitive and easy to use, but the hardware is simply able to take on more challenging tasks than instruments like the Klein Tools Coax Tester. Which makes the CM-8 a good choice for someone testing high resistance lines running 100 ohms. Last but not least, the Southwire Tools & Equipment M500CX4 Coax Continuity Tester/Mapper is similar ot the Klein Tools Coax Tester. It’s not able to take on enormously lengthy cables, or cables with incredibly high resistance, like the CM-8. But it’s even bit as intuitive, and it’s designed to accommodate slightly more throughput than the Klein Tools’ instrument. 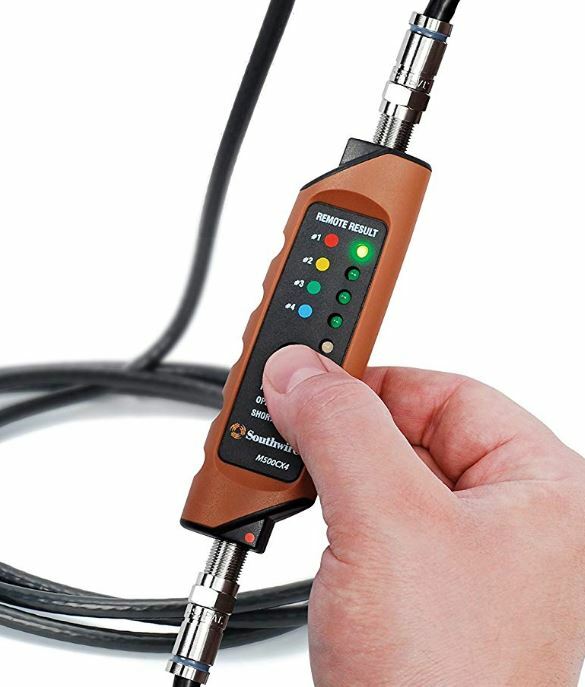 For someone who’s going to be using their coaxial cable tester tracer for more than the occasional measurement, the M500CX4 might be worth grabbing.